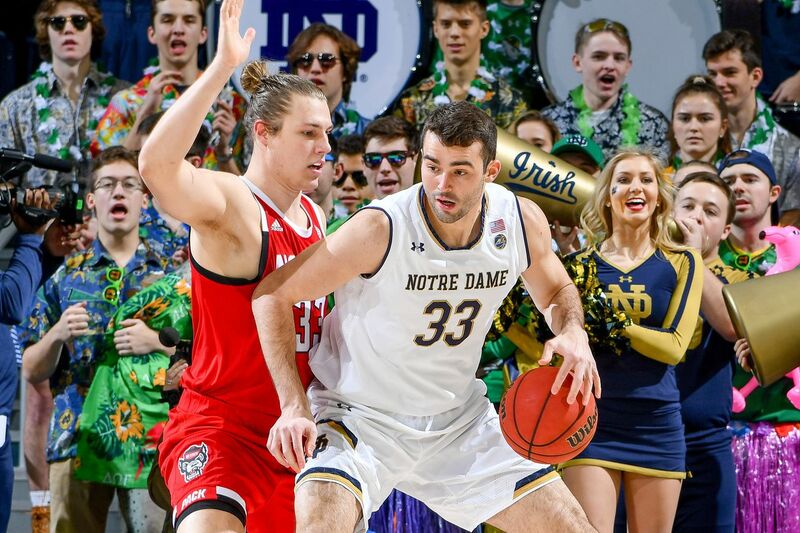 The Notre Dame Fighting Irish men’s basketball team fell to the #17 North Carolina State Wolfpack today, losing a hotly-contested game where NC State couldn’t get up by more than about 5 or 6 but the Irish couldn’t manage to grab a lead or keep NC State off the offensive glass. The Irish, now 11-7 overall and 1-4 in ACC play, were led by John Mooney’s 19 points and 16 rebounds, marking yet another double-double for the junior who’s truly been the lynchpin of this team. In this one, though, he got some key help from freshman Dane Goodwin (19 points on 7-of-10 shooting), who broke out in this one and almost single-handedly kept the Irish in it throughout the second half. He was sensational. ND also got contributions from T.J. Gibbs (13 points, 5 assists), DJ Harvey (10 points, 5 rebounds), and Chris Doherty, who, in his debut, was really good at providing energy, hustle, defense, and rebounding, collecting 3 boards in his 6 minutes of play. Prentiss Hubb also chipped in 8 points and 4 rebounds. The Irish had another rough day shooting the ball, making 41% overall and 25% from deep (a horrid 7-for-28 from long range). They were also out-rebounded 43 to 38 by NC State. The Wolfpack, meanwhile, were led by CJ Bryce, whose 23 points (5-of-5 from deep) paced the NC State attack that always had an answer for each Irish mini-run. He got some help from Devon Daniels and Torin Dorn, who scored 15 and 13 respectively, and D.J. Funderburk, who scored 11 and had 6 boards. NC State shot 44% from the field and 37% from 3. The Irish play next against the Georgia Tech Yellow Jackets on Tuesday evening, looking to build on the mostly-strong performance today and hopefully pick up a second ACC win and right the ship a bit before having to play the Virginia Cavaliers and Duke Blue Devils in back-to-back games.